Let's say you opened a Fixed Deposit account with your bank three years ago, which gave you an annual return of 7% - compounding quarterly for three years. You had also invested the same amount in a Mutual Fund, which at the end of three years gave you a return of 28%. And you had also started an SIP (Systematic Investment Plan) where you monthly deposited a sum - giving you an absolute return of 25% at the end of three years. Which one of your investments gave you better results? In this article I will discuss some commonly used methods which investors use for calculation and comparison of return on their investments. My intention is to provide a brief of these methods to the budding investors in lay-man words - why there are multiple methods for calculation of returns on investment and what do they calculate. I will publish a separate article for calculation of these returns using tools like Microsoft Excel or Google Spreadsheet. First, we have Absolute Returns. This is the simple return on your initial investment. To calculate point-to-point or absolute returns, we don't consider the holding period as a factor. So if your initial investment was INR 50,000 and after a certain period, say three years, your fund becomes INR 75,000. The absolute return from your investment comes to 50%. In the above example you have 50% return for three years. To calculate Average Annualized Return, one can simply divide the absolute rate of return (50%) by the holding period in years (3). Nothing too complicated here. YET! Let's move to CAGR (Compounded Annual Growth Rate). To calculate CAGR, apart from the holding period of an investment, the compounding-factor is also considered for calculation. Hence it is preferred to Average Annualized return. CAGR is only suitable for lump-sum investments, where funds are invested and redeemed only once over a certain period. XIRR on the other hand is useful for investments made in instalments. Let's say you have started an SIP of INR 1000 per month for a period of 3 years (36 instalments). Here each of your instalment of INR 1000 is invested for a different period of time, i.e. your first instalment remained invested for the whole holding period (36 months), second instalment for 35 months and similarly your last, 36th instalment, was invested only for a single month. 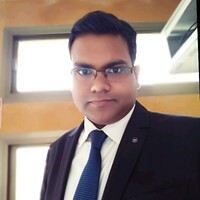 In case of XIRR, considering the final return on entire investment, using a complex approximation method, a common CAGR for each individual instalment is calculated in such a way that the total of return on each instalment is the same as the final return on the investment at the time of redemption. Here one should know that CAGR can only be calculated for a sum invested and redeemed only once - hence calculated individually for each instalment. That adjusted CAGR which is the same for each instalment is, XIRR. To make an investment decision or to estimate profitability of an investment, another commonly used tool is Internal Rate of Return (IRR). 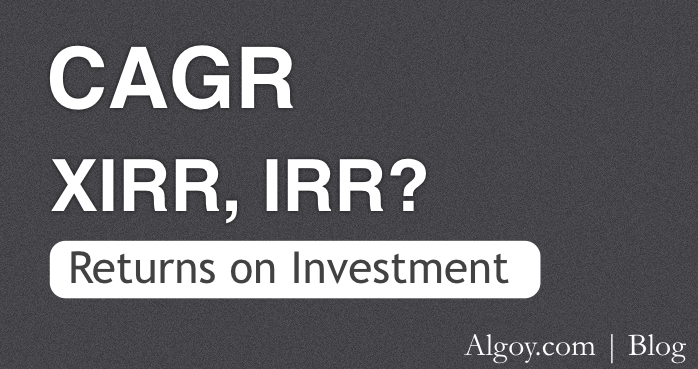 IRR is actually an annualized rate of return on an investment. Say, you purchased a car today for INR 5,00,000 and rented it out for three years. You earned INR 2,00,000 in the first year, INR 2,50,000 in the second year and INR 1,00,000 in the third year. Now you sold the car for INR 2,00,000. In this case you can use IRR to evaluate profitability of your investment in that car. In another example, say you've deposited INR 10,000 in an investment product which in return promised you a fixed amount INR 6,000 over the next two years. Here also, IRR is useful for calculating annualized return. I hope above explanation clarifies why various rates of returns on investments are used. I intend to publish a separate post about calculating these forms of returns using tools like Microsoft Excel or Google Spreadsheet. Link to the same will be shared shortly.